How likely is another Stanley Cup final between the back-to-back-champion Pittsburgh Penguins and the Nashville Predators? Tim Wharnsby looks at why these two are on track for the NHL's first Cup rematch in nine years. 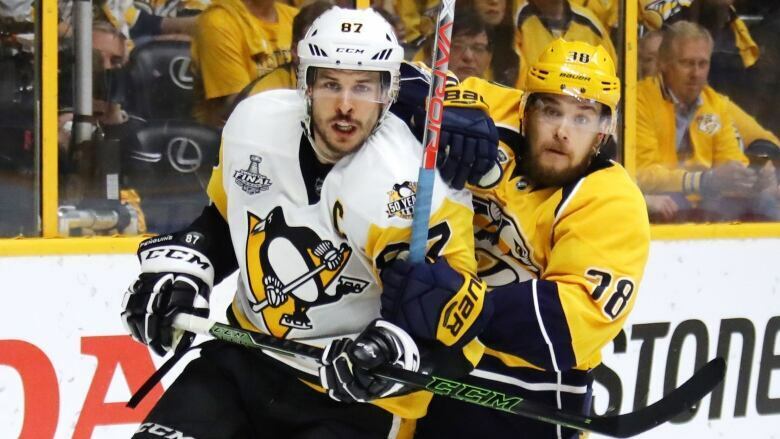 Are we headed for another Stanley Cup final between the back-to-back-champion Pittsburgh Penguins and the team they defeated in the six-game final nine months ago, the Nashville Predators? This certainly appears to be the case. We're not ignoring contenders like the Winnipeg Jets, Vegas Golden Knights, Tampa Bay Lightning, Boston Bruins and other clubs that have put together stellar regular seasons, but no teams have performed as well as the Predators and Penguins since the calendar flipped to 2018. The Penguins took their sweet time finding their groove this season. After a 4-1 loss on New Year's Eve in Detroit, Pittsburgh was 22nd overall in the 31-team league and in danger of not making the playoffs. The loss of veterans like Chris Kunitz, Nick Bonino, Matt Cullen, Ron Hainsey and Trevor Daley appeared difficult to overcome. But after three months of struggles, captain Sidney Crosby picked up his play and Evgeni Malkin has been brilliant and is now considered a strong Hart Trophy candidate. Phil Kessel also has been dazzling; with 10 games left on the docket, he only needs four points to post his career-best season. Pittsburgh general manager Jim Rutherford worked his usual deadline magic, and the addition of Derick Brassard will be big in the playoffs. He played well for the Ottawa Senators in their march to the East final a year ago and contributed to the New York Rangers' run to the 2013-14 Stanley Cup final. The Penguins have even survived a nine-game absence from No. 1 goalie Matt Murray, who is due to return this week from a concussion. The Predators, on the other hand, have been a model of consistency this season and keep improving as the playoffs quickly approach. They are first overall as of Monday and appear destined to win the Presidents' Trophy. They are currently on a 13-0-1 run — only the Bruins have had a longer point streak this season at 14-0-4 — and Nashville was the first team to clinch a playoff spot on Friday. They added Bonino in the off-season and centre Kyle Turris through a trade last fall. Dependable defenceman Ryan Ellis returned to action from off-season knee surgery in early January. Then former captain Mike Fisher unretired and veteran general manager David Poile added another piece in right wing Ryan Hartman from the Chicago Blackhawks at the trade deadline. The Predators already have strong goaltending with Pekka Rinne and an outstanding defence corps with current captain Roman Josi, P.K. Subban, Ellis and Mattias Ekholm. Now they have one of the strongest middles with Ryan Johansen, Turris, Bonino and Fisher to combat the Penguins' capable group of Crosby, Malkin, Brassard and Riley Sheahan. The NHL hasn't had repeat Stanley Cup finalists since the Red Wings and Penguins clashed in the 2007-08 and 2008-09 championship series, with Detroit winning the first one and Pittsburgh taking the rematch. The Penguins have exhibited resiliency this season. They won't go easy. They have a shot at winning a third championship in a row, something that hasn't been accomplished since the Islanders won four straight between 1979-80 and 1982-83. The Predators, however, have improved their roster and have high hopes of duplicating what Pittsburgh did to Detroit nine years ago.